Most of the time, what we want isn’t as far out of reach as we think it. The trouble is, we think it’s out of reach, then we create stories about it, and spiral from there. That’s when the funk, jadedness, bitterness, and even meltdown can happen. And look, we’ve ALL been there. So please don’t beat yourself up about it. 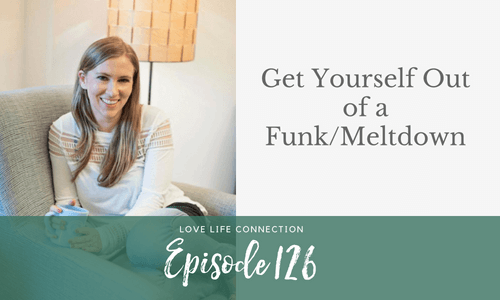 At the same time, you don’t have to stay in your funk or meltdown. So channel your inner coach and coach yourself through anything with the three tips I share in this podcast. What’s gonna make you happy in love? Get the FREE checklist: 7 Things Every Woman Needs To Find Love: What You Need To Ask Yourself to Attract In Real Love That Your Friends (Or Therapist) Don’t Know to Ask. Download your free copy HERE.